Hucks, Alice Winlow. “Twilight.” Vancouver Sun (3 July 1943): 2. This poems might be called “Twilight,” but it seems sufficiently eerie to post on Hallowe’en.You’re welcome. 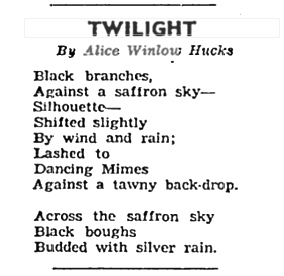 Interestingly, Alice Winlow Hucks is not the same person as Alice Dudley Winlow (1879-1946), who was an executive on the board of the Vancouver Poetry Society and lived in Vancouver from her 1905 marriage to Frederick Winlow until her death in 1946, only three years after the publication of this poem. Alice Winlow Hucks was born in Elgin, Ontario, in 1904—the year before Alice Dudley moved to Vancouver—and married John Stewart Hucks in Vancouver in 1934. By all appearances they are in no way related, but one can imagine that Alice Winlow Hucks might have felt it an honour to share the name of an illustrious older member of the Vancouver Poetry Society at the beginning of her own poetic career.